way, 4,500 miles from Manila. But even before this, on the first day of war, the Japanese attack on Pearl Harbor had destroyed the Battle Force of the Pacific Fleet and nullified all plans to come to the aid of the Philippines. greatest military and naval disaster in our Nation's history. "6 With this smashing blow, the Japanese made obsolete the carefully prepared plans of defense in the event of war in the Pacific.7 The RAINBOW plan called for the progressive movement of the Pacific Fleet across the Central Pacific by the capture of the Caroline and Marshall Islands and the establishment of an advanced base at Truk. The fleet would thus open the line of communications, establish superiority in the western Pacific, and come to the relief of the Philippine Islands. Along this protected line of communications would flow the supplies and men that would enable the Philippine garrison to beat back any Japanese effort to seize the Islands. By 1000 on the morning of 7 December, the force required to put RAINBOW into effect, the Battle Force of the Pacific Fleet, lay in ruins in Pearl Harbor. The Philippines were isolated, cut off from the nearest base 5,000 miles away, even before they had felt the first blow of the war. Their only hope now lay with the Far East Air Force and the Asiatic Fleet. By breakfast, the news of the attack on Pearl Harbor had reached all ranks. The men had for so long accepted the fact that war with Japan might come that the event itself was an anticlimax. There was no cheering and no demonstration, but "a grim, thoughtful silence. "11 War with Japan was not, for the American and Philippine troops, a remote war across a wide ocean. It was close and immediate. This unforeseen development filled the Japanese commanders with nervous apprehension. The timetable for the attack was extremely close and left little leeway. As the early morning hours rolled by, anxiety increased. By this time, the Japanese believed, the American high command in the Philippines would have received news of Pearl Harbor and either sent the Far East Air Force southward or set up an effective defense against the impending raid. All hope of surprise would be lost. About this time the Far East Air Force commander received a transoceanic telephone call from his air force chief, General Arnold. Brereton explained what he was trying to do, and Arnold told him what had happened at Pearl Harbor, so that, as he later explained, Brereton would not be caught in the same way and have his "entire air force destroyed. "15 By this time, reports of enemy flights were being received at air force headquarters and planes of the Interceptor Command were sent up. Around 0800 the heavy bombers at Clark Field were ordered aloft on patrol, without bombs, to avoid being caught on the ground. At 1000 Brereton renewed his request to take offensive action. "I personally called General Sutherland," he says, "and informed him . . . that if Clark Field was attacked successfully we would be unable to operate offensively with the bombers. "16 Again the request was denied. Ten minutes later, Colonel Eubank started back to Clark Field with instructions to dispatch a photographic reconnaissance mission immediately to southern Formosa. General Brereton's surmise, however, was not entirely without foundation. It was evidently based on the 27 November warning from the War Department. That warning had stated that "if hostilities cannot be avoided the United States desires that Japan commit the first overt act. "23 The War Department had been careful, however, not to restrict MacArthur's freedom of action, and had authorized him in the same message to "undertake such reconnaissance and other measures as you deem necessary" prior to hostile Japanese action. In the event of war he was to execute the tasks assigned in RAINBOW. In the period between the receipt of this message and the outbreak of hostilities, the B-17's had flown reconnaissance missions north of Luzon in the direction of Formosa. Their search sectors, according to General Sutherland, reached to "the southern edge of Formosa with one segment of the pie running up the east coast of the island a little way. "24 But General Brereton declares that he was instructed by MacArthur to limit reconnaissance to "two-thirds of the distance between North Luzon and Southern Formosa. "25 Later, he says, he secured permission to extend the northern limit of the search sector to the international treaty boundary between the Philippines and Formosa.26 On the basis of Sutherland's statement, then, it was possible to conduct a partial reconnaissance of Formosa before the war; according to Brereton there was no prewar reconnaissance on MacArthur's orders. On 8 December, in summarizing the results of the Japanese attack, MacArthur had told the War Department: "I am launching a heavy bombardment counterattack tomorrow morning on enemy airdromes in southern Formosa. "28 It is evident, then, that MacArthur himself planned, by the afternoon or evening of the 8th, to execute an attack against Formosa with the remaining B-17's. against Formosa, to take place that day, was finally authorized; (4) that the heavy bombers were back on Clark Field after 1130 on the morning of 8 December; and (5) that MacArthur planned an attack against Formosa for the morning of 9 December. As the Japanese planes approached northern Luzon, the airborne American aircraft received the all-clear signal and were instructed to land. By 1130 nearly all the planes were back at their bases. The two squadrons of B-17's were on Clark Field, loading with gas and bombs for the raid against Formosa. The 20th Pursuit Squadron was also at Clark after its vain attempt to intercept the last Japanese flight. At Nichols, the 17th Pursuit Squadron, which had been covering Clark, was landing to refuel. The 3d and 34th Pursuit Squadrons were standing by at Iba and Del Carmen.32 Shortly before 1130, reports of an approaching enemy formation began coming in to the plotting board at Nielson. Field.40 All but one of the B-17's was lined up on the field and the fighters were just getting ready to take off. After the warning of the Pearl Harbor attack, and after the loss of several valuable hours because of bad weather, the Japanese pilots did not expect to find so rich a harvest waiting for them. But they did not question their good fortune. The first flight of Japanese planes consisted of twenty-seven twin-engine bombers. They came over the unprotected field in a V-formation at a height estimated at 22,000 to 25,000 feet, dropping their bombs on the aircraft and buildings below, just as the air raid warning sounded. As at Pearl Harbor, the Japanese achieved complete tactical surprise. With the first high wail of the siren, the men on the field below streamed from the mess halls. As the bombers passed over, the Americans could see the falling bombs glistening in the sunlight. Then came the explosions, hundreds of them, so violent that they seemed to pierce the eardrums and shake the ground. Throwing aside momentary disbelief and stupefaction, the men rushed to their battle stations. The scene was one of destruction and horror, unbelievable to the men who only a few minutes before had been eating lunch or servicing the planes. Flash fires sprang up and spread rapidly to the trees and long cogon grass around the field "roaring and crackling like an evil beast. "41 Dense smoke and a heavy cloud of dust rose over the field. Against such odds, the Americans could offer little opposition. The 200th Coast Artillery (AA) experienced considerable difficulty with its 3-inch gun ammunition, the most recent of which was manufactured in 1932. The percentage of duds was abnormally high and "most of the fuses were badly corroded." Only one of every six shells fired, says one observer, actually exploded.42 Acts of personal heroism were commonplace. Ground and combat crews manned the guns of the grounded planes, and men dashed into flaming buildings to rescue their comrades as well as supplies and equipment. Others braved the strafing gunfire to aid the wounded. One private appropriated an abandoned truck and made seven trips with wounded men to the station hospital. they taxied for the take-off.43 A similar number was caught in the strafing attack. The 3 airborne fighters shot down 3 or 4 Japanese fighters. The 11th Air Fleet's attack against Clark was even more successful than the worried Japanese had expected. The operation had been well planned and executed. The first flights of bombers had concentrated on the hangars, barracks, and warehouses, and left them a burning ruin. Some of the grounded planes had been damaged in these bombings but the greatest casualties were inflicted by the low-level attacks of the Zeros which followed. Casualties in men were fifty-five killed and more than one hundred wounded. Simultaneously with the raid against Clark, other 11th Air Fleet planes were attacking the fighter base at Iba. The 12 planes of the 3d Pursuit Squadron, which had been patrolling over the China Sea, low on gas, returned to base. As they were circling to land, Iba was struck by 54 Japanese twin-motored naval bombers escorted by 50 Zeros. Effective action by the P-40's resulted in the loss of 2 Japanese fighters (probables) and kept the Zeros from carrying out the low-level attacks which were so successful at Clark. But the losses at Iba were almost as great as at Clark. Barracks, warehouses, equipment, and the radar station were destroyed. Ground crews suffered heavy casualties and all but 2 of the 3d Squadron's P-40's were lost. The reaction from Washington headquarters of the Air Forces was delayed but explosive, despite a radio from MacArthur stating that the losses had been "due to overwhelming superiority of enemy forces. "45 General Arnold, when he received the news of the losses in the Philippines, "could not help thinking that there must have been some mistake made somewhere in my Air Force command," and he decided "to tell Brereton so. "46 Brereton had just returned from an inspection of Clark Field when he received a transoceanic telephone call from an irate General Arnold asking "how in the hell" an experienced airman like himself could have been caught with his planes down. Apparently he felt his explanation had not satisfied General Arnold, for he immediately reported the conversation to MacArthur and asked his help in presenting the situation to the Army Air Forces chief. According to Brereton, MacArthur was furious. "He told me to go back and fight the war and not to worry,"
Brereton recorded in his diary. "As I walked out of his office he asked Sutherland to get General Marshall on the phone. "47 Unfortunately, there is no record of the telephone conversation that followed. Thus, after one day of war, with its strength cut in half, the Far East Air Force had been eliminated as an effective fighting force. Of the modern combat aircraft, only 17 of the original 35 B-17's remained. Fifty-three P-40's and 3 P-35's had been destroyed, and an additional 25 or 30 miscellaneous aircraft (B-10's, B-18's, and observation planes) were gone. In addition, many of the planes listed as operational were heavily damaged. Installations at Clark and Iba were either burned out or badly hit. Total casualties for the day were 80 killed and 150 wounded. The total cost to the Japanese was 7 fighters.48 The conclusion of the Joint Congressional Committee which investigated the Pearl Harbor attack, that it was the greatest military disaster in American history, is equally applicable to the Philippines. The catastrophe of Pearl Harbor overshadowed at the time and still obscures the extent of the ignominious defeat inflicted on American air forces in the Philippines on the same day. The Far East Air Force had been designed as a striking force to hit the enemy before he could reach Philippine shores. The heavy bombers were an offensive weapon, thought capable of striking the enemy's bases and cutting his lines of communication. Hopes for the active defense of the Islands rested on these aircraft. At the end of the first day of war, such hopes were dead. Wherever the responsibility lies for failing to move all the B-17's south, there still remains the question of why the remaining bombers were caught on the ground. Brereton argues that had he been permitted to attack Formosa when he wished, the planes would not have been on the field. Implicit is the assumption that if the raid had been successful, the Japanese could not have made their own attack. MacArthur denied knowledge of such a proposal in 1946, but in a radio sent on 8 December 1941 he stated that he intended to attack Formosa the next morning. General Sutherland, in one interview, claimed that Brereton was responsible for deferring the attack, and in another interview, that he himself deferred the attack because the Far East Air Force did not have sufficient target data for such an attack. It is clear that this project was discussed by Brereton and Sutherland, that MacArthur mentioned it in a radio that day, and that authorization to execute the attack was delayed until 1100 that morning. Whether such an attack would have had a serious chance of success is not argued by either Sutherland or Brereton. Knowing now what the Japanese had at Formosa, the possibility of a successful raid by the B-17's seems extremely remote. The Far East Air Force admittedly had sketchy information on the strength and disposition of the Japanese forces on Formosa. Had it been known that there were over five hundred Japanese planes waiting on Formosa, ready to take off, it is doubtful that anyone would have considered the project seriously. Moreover, the B-17's would have had to fly to Formosa, out of fighter range, unescorted. Once there, they would have been greeted by swarms of Zeros. "An attack on Formosa, with its heavy air concentrations," MacArthur later wrote, ". . . was impossible, would have had no chance of success. "53 Sutherland's request for a photo reconnaissance mission prior to an attack would appear, therefore, to have been entirely justified. The heavy bombers were indeed far too valuable to risk in so hazardous a mission. nications at this critical juncture. There is no way of resolving this conflicting testimony. Assuming that Colonel Eubank did not receive the warning from Nielson Field, there still remains one final question. Were the aircraft on the field adequately dispersed for wartime condition? It is not possible to state definitely how the aircraft were dispersed when they came in at 1130. There surely must have been some recognition of the danger of an enemy air attack at any moment. The Japanese state that they were "surprised to find the American aircraft lined up on the field. "54 And at least one flight of four B-17's was lined neatly on the field when the Japanese came over. Captain Ind tells of finding photographs, one of which was taken by an American pilot flying over the field, showing the planes inadequately dispersed for any but high-level bombing attacks. "This entire set of photographs," he says, "was removed from my desk a few nights later. No one seemed to know what had happened to them. "55 This question, like the others, remains unanswered. On the morning of 8 December, the only portion of the Asiatic Fleet to come under fire was the small aircraft detachment at Davao with the tender Preston. After the attack from the Ryujo-based dive bombers and fighters, Preston let pass four Japanese destroyers, and then slipped out of Davao Gulf to escape southward. Fleet, Task Force 5, was steaming south, and on 10 December had left Philippine waters. 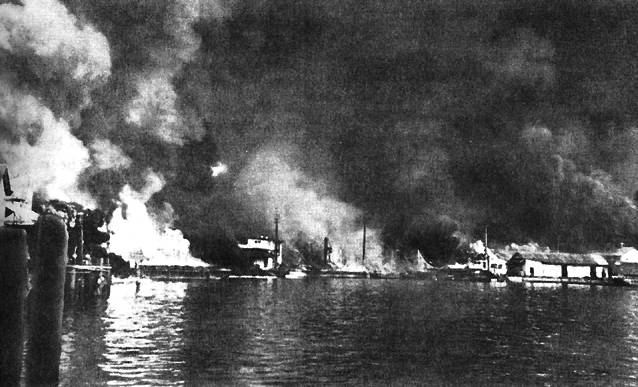 at Cavite Navy Yard, small-arms shells explode (left) as the torpedo-loaded barge (center) burns. The naval vessels were not the only ships to move south. At the start of the war there had been about forty large merchant ships, many with valuable cargoes, in Manila Bay. The Navy had promptly closed the bay to all outbound traffic, and had extinguished the lighthouses on Corregidor and two other outlying islands.76 Fortunately the merchant vessels had escaped attack during the first day of operations. In the next two days, many commercial vessels sought protection in Manila Bay and were guided through the mine fields by the inshore patrol. During the attack of the 10th, the Japanese had dropped a few bombs among these ships, scoring one hit. Admiral Hart had told the shipmasters on the 11th that their vessels would be safer in Visayan ports, and that evening the commercial vessels began to steam out of Manila Bay. All but one finally escaped.77 The Japanese had missed a golden opportunity to cripple Allied shipping. Meanwhile, the Japanese air force continued the systematic destruction of the air and naval forces remaining in the Philippines. There had been no raids on the 11th, largely because the weather over Formosa had been bad. The planes returning from the raid on the 10th had been forced to set down wherever they could, thus scattering units among the many Formosan fields. The next day was spent in reassembling the units.79 On the 12th and 13th the Japanese again attacked in force. 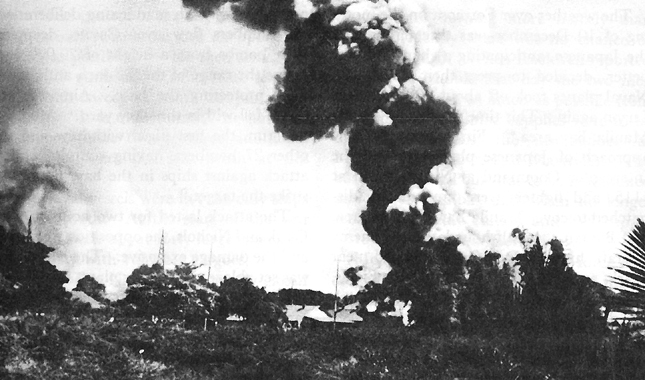 On these two days hundreds of Japanese Army and Navy planes struck targets on Luzon at will in a final effort to destroy the remnants of the Far East Air Force and the Asiatic Fleet. By 15 December the air strength of the Philippines had been reduced to a handful of fighters. All hopes for preventing the main Japanese landings soon to come and for keeping the supply routes open rested now on these few planes and on the submarines of the Asiatic Fleet.